Oh, wow. Please tell me I’m not that only that thought last week was an incredibly long and unproductive week… This baby is getting big enough that I’m uncomfortable all the time, don’t sleep well and just generally want to do nothing other than lay on the couch. All. Day. Long. Not only that, mortality seems to have the theme for last week. A friend unexpected lost her husband to spinal meningitis and now is the sole provider and caregiver of their three young children. Health is such a fragile thing. It’s shocking and scary how quickly things can change. Annnd… to top it off… My Mr Right wrecked on his motorcycle last weekend. He’s fine. He really just scraped and bruised his knee. And it’s mostly cosmetic damage to the bike. But, it was a bit of a wake up call when he walked back in the door A LOT sooner than I expected him with a bloody knee and torn clothes. Definitely made me remember the important things in life and that I never want to take my most favorite people for granted. So… How was your week?! Ok. Here is a super quick and easy (and SOO CHEAP!) little project. It’s actually part of my little sister’s Christmas gift. She never reads my blog though, so I’m safe. We do a fair amount of traveling, but if you have little kiddos around this would also be fabulous to have. Little Monkey has been the victim of burns from my flat iron. He’s only ever touched it once while it was hot… he’s no dummy… but a case like this could have prevented it. Ready? A Flat Iron Heat-Resistant Case. 1) Take your mitt and cut it down to fit your iron. I used a mitt, cut the thumb off and thinned it down a little. You could definitely do this with a hot pad too. Just fold it in half and sew the top and side together. Just make sure you leave enough seam allowance for your iron to fit in the mitt once you sew up the open edge. but it was so skinny and thick I couldn’t get it flipped right side out. 2) Turn your mitt inside out and pin it so the edges meet. Sew the side of your mitt together. Secure with a good back stitch at each end. 3) This is, by far, the hardest and most time consuming part of this whole project. Turn your mitt right side out. This took me a good twenty to thirty minutes and several hand cramps (because the mitt is so thick) to get it right side out. I ended up using my teeth… so if you can borrow an extra set of hands, it might be helpful… just sayin’. 4) Wash the mitt, ’cause well, you used your teeth and there is spit all over it, right. Eek. TMI? 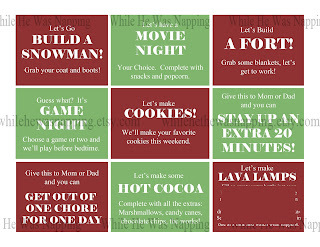 =) Make a cute little box or something to gift it in. Ta-da! Even with the thirty minutes it took to turn it right side out, I still had this project done in about an hour. An hour of my time and buck from my pocket? I’d call that a super duper gift. Little side note: I didn’t purposefully leave the sealed end of the mitt wider than the open end, but it worked out very nicely to have that little bump as a place to store the cord when you wrap it up to put it in your suitcase or whatever. It goes in even better than the last photo of this post shows, I just wanted you to be able to see that the iron was in the case. 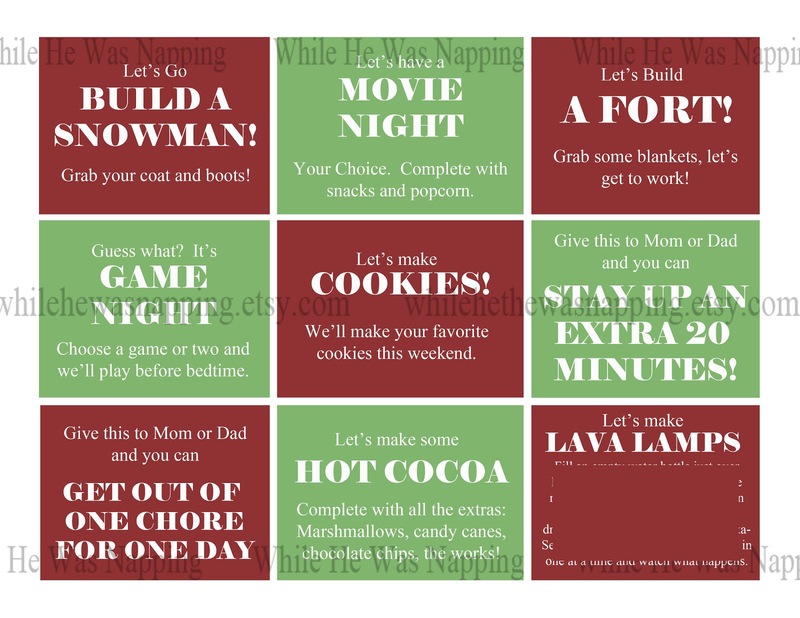 And… There is a set of printable Kid’s Activity Coupons now available in my Etsy Shop, if you’re looking for some cheap and easy stocking stuffers… Just FYI. thanks for your great idea!! I have a curling iron holder that is heat resistant that I bought a LONG time ago, but have never seen another and have been looking. You have just shown me one of the best DIY projects I’ve seen in a while! Thank you, thank you, thank you! This is so about to be a stocking stuffer for my daughter. I will make sure I find help to turn it. Thanks for sharing! awesome idea! thanks! my flat iron is a bit thicker than yours, but I think this would work!